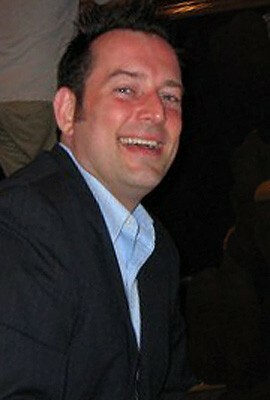 Andrew Volkoff the Director of The Fantasticks at Barrington Stage Company. 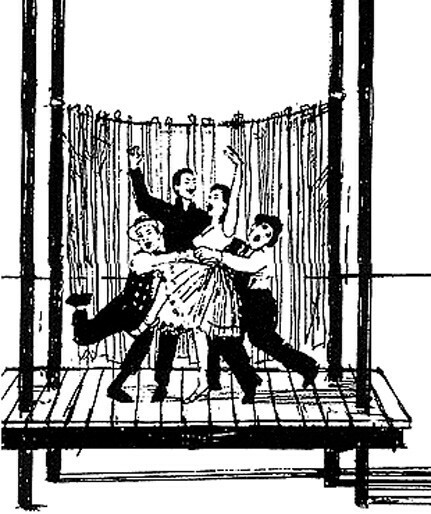 A sketch from the original production in 1960. 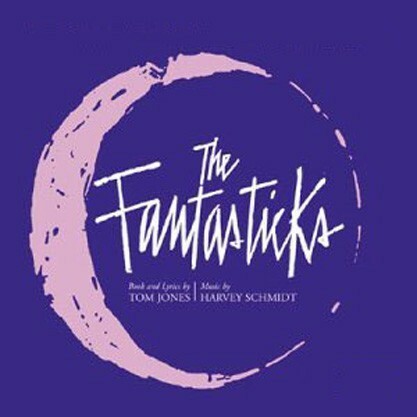 A design for The Fantasticks which is the most often performed musical in the world. Candid shot of the auditions for The Fantasticks. 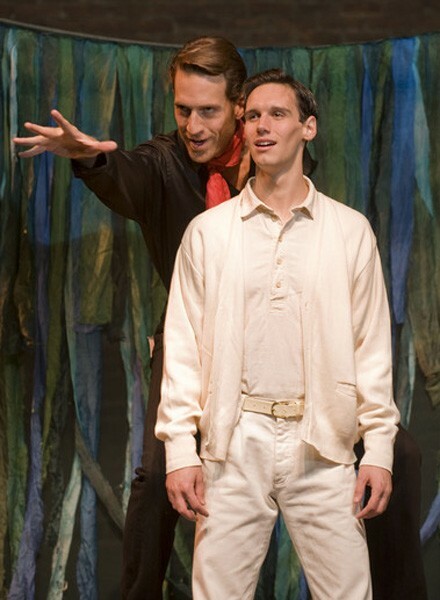 Steve Wilson and Cory Michael Smith in The Fantasticks. Dana DeLisa and Cory Michael Smith play the young couple. The Fantasticks has the reputation of being a simple musical to stage, but don't tell director Andrew Volkoff that. His to-do list still has dozens of items on it. With the technical rehearsals finished just yesterday, he was busily tying up a hundred loose ends as he and his cast prepared for the first preview tonight. After three previews to polish the details, the opening is Saturday night, and The Fantasticks will then be performed almost every night through October 18. Volkoff is helping Barrington Stage to tackle yet another classic musical, this one off season, and it is a big deal. In the midst of the sound and the fury, we managed to corner the charming director, and peppered him with some questions of our own. Volkoff has been the go-to director for several successful one person shows (Underneath the Lintel, I Am My Own Wife, Fully Committed). They have all been well received. 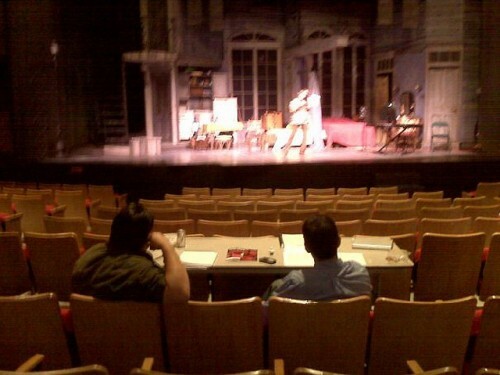 It must be a refreshing change to have a musical instead of a one man show to direct. How is doing a big cast show different? Well, there are many more moving parts! Not only the super cast, but there's also the dancing and the music to incorporate on top of the staging that I usually do. Going from devoting 100% of my energies to one person to devoting all of my energies to 10 people is a challenge, sure, but it is a refreshing change. I was beginning to get a little lonely! Ten people in the cast? Eight marvelous actors actually, plus the musicians - the piano and a harp. That's how the first 17,000 performances were done off-Broadway, with that arrangement. The harpist is one of our own, Theresa Mango, from Stockbridge. You seem to divide your time between the Berkshires and New York City. Do you have to readjust when moving from one to the other? Not really. I've been working at Barrington Stage now, on and off, for eleven years, so the Berkshires are like a second home for me. The main difference is the slowing down. Going from NYC to the Berkshires produces a certain calming and quieting effect which is just great. Just look at those glorious trees turning color in the hills! And the reverse is true as well. You can't have one without the other, I suppose. Theatre people like me travel a lot for our jobs, and so it's become second nature for me: the packing, making a home in a city for anywhere from a week to a month, putting up a show and then heading back to NYC and unpacking. The unpacking is always easier than the packing, though. What is different about preparing a show in the Berkshires as opposed to New York? The best thing about working at Barrington Stage - besides catching up with Julianne Boyd (BSC's Artistic Director) - is that everyone's here to simply do the work. That means all the usual distractions of New York - friends, nightlife, the City, all of it - have been limited and everyone can simply focus on putting together the show. Its a great gift in a way, rehearsing up here. The focus on the show and the work is much more intense. You have a reputation for being able to use every square inch of stage space to expand a production. Other works you've staged were in the intimate Stage 2. Now you have the Main Stage. How is that working for this show? As for being able to use every inch of our Stage 2, thanks for the compliment! I did work that space to its limit. Creating a show on the Mainstage gives me a lot more space to work with which is an extraordinary gift for any director. Nonetheless, The Fantasticks requires an intimacy and rapport with the audience and while the Mainstage is great for the production, the auditorium is still modest, and serves the production's intimacy surprisingly well. Being an old vaudeville house, the stage allows for a closeness to the audience that many larger houses do not, helping the play reach across the footlights and engage the audience. 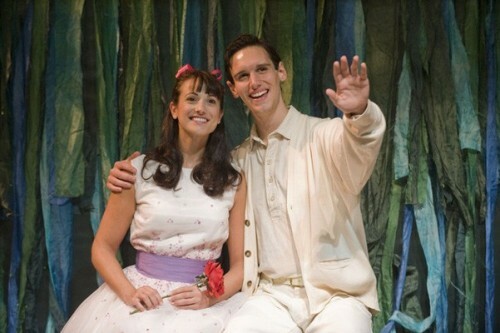 The Fantasticks has been around a long time, it is almost as timeless as Our Town. How well do you think it speaks to the internet generation? Being of the internet generation, I can say that the story speaks to me. The show has a richness and complexity hidden underneath a simple tale. We all get something a little different from it depending on where we are in our lives, and that is the beauty of it. Some people will connect with the story of young love. Others will connect with the struggle parents face to protect their children. Still others may identify with being given (or wanting) one last hurrah in the spotlight. There are many different things to take away from the production, no matter who you are or when you see it. People see the show every year (and have been seeing it for years) just to reconnect with that universal truth that it wakes up in them. All of the people involved in this production hope that each person in the audience will discover something that speaks to them, and stays with them, as well. The Fantasticks runs from October 7 through 18 on the BSC Mainstage, with an official opening on Saturday, October 10 at 8pm. Performance times are: Wednesday 7pm; Thursday-Saturday 8pm; Sunday 3pm. Additional performances will take place on Sunday, October 11 at 7pm, Wednesday, October 14 at 2pm and Saturday, October 17 at 4pm. Tickets are $15-35. $15 mezz/$20 orchestra tickets are available for October 7 and 8 previews. Tickets are on sale now at 413-236-8888 and http://www.barringtonstageco.org.